Overeating is the single biggest threat to your Healthy Eating habits. It’s the number one influence in obesity, and metabolic disease not to mention general unease and poor dietary choices. It’s natural to overeat once in a while. Even I may go a little overboard here and there. but chronic overeating is when you purposely eat more than you need to in order to satisfy your appetites. Let’s look at 7 of the biggest reasons why people may overeat and what you can do to prevent them. People don’t like to hear that overeating is a problem because many see eating a lot with their pursuit of living a fulfilling life. 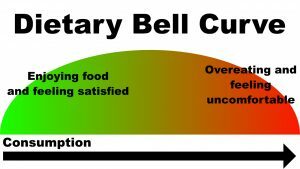 Suggesting you should cut back your diet is often associated with having a restrictive diet that leads to deprivation and unsatisfactory diet habits. Therefore, eating as much as you can is how you can live a rich and fulfilling life. Ironically, overeating actually reduces the satisfaction and enjoyment you gain from food. Yes, consuming enough is very important, but overdoing it actually reduces your enjoyment of what you eat. This is due to the natural bell curve that happens with any habit in life. At first, you partake of your food or activity and enjoy it. After a while, your enjoyment begins to taper off as you continue to consume. Eventually, the very thing that brought you enjoyment starts to make you uncomfortable. This is what happens when you overeat. Cutting back doesn’t mean restricting your diet to the point where you’re depriving yourself. It means cutting back on overeating so you don’t eat so much it doesn’t bring you negative consequences. Not only will this help you avoid the effects of overeating, but you’ll get to enjoy your food even more. Overeating and trying to build muscle often go hand-in-hand due to the myth that you need to be in a calorie surplus to build muscle. I’ve covered why a calorie surplus isn’t necessary to build muscle in the video below so I’ll spare you the long rant on this crazy myth for now. While you do need to have an adequate diet to build muscle, you can’t force muscle growth through overeating. Overeating can’t help you build muscle any more than beating your head against a squat rack. Nonetheless, the idea persists that you need to overeat to have any hope of building muscle so guys force feeds themselves like crazy. Unless you’re a competitive bodybuilder, the whole bulking and cutting cycle is a waste of time and energy. Instead, make sure you’re eating enough to satisfy your hunger and fuel your workouts. It’s your workouts that are much more responsible for your muscle growth than anything else. Many kids grow up being told to clean their plate. This idea persisted into adulthood with the notion that you have to finish whatever serving size you’re given so you don’t waste food. Once again, the ironic thing is this idea not only causes overeating, but it also wastes a lot of food. Eating more than your body can use is still wasteful. Food doesn’t go to waste just because you don’t eat it. It can also go to waste because you can’t use it. Instead of throwing the food in the trash you’re throwing it into your body where it’s either stored as fat or passed. Forcing yourself to eat massive portions doesn’t help you or the planet. A better plan would be to eat to satiety and then save the rest for a meal or snack later on. That way, you’re able to productively use all of the food plus you can get more than one meal from the same portion. This saves you the time and money of preparing another whole meal or snack while saving the food you would have eating for that meal instead. This happens when you’re presented with an opportunity to eat something you normally wouldn’t indulge in like Christmass cookies or having a cake to celebrate a friends birthday. It’s not every day you’re celebrating so better take advantage of it while you can. The funny thing about opportunity eating is it’s always around us. There’s always some holiday or life event happening. Restaurants always have limited time specials or some new edition Oreo is coming out. There’s always a new opportunity every day. By all means, take advantage of the occasion is you like, just be prudent. You don’t need to eat a tin full of cookies to celebrate the holiday season. You also don’t need to overeat for every little milestone you cross in life. Eat enough to celebrate, but not so much you overindulge and regret it later. Sometimes, you can overeat because you’re sticking to a diet program. It could be a program you found on the internet or a magazine. In some cases, a coach could be giving you this program. Review the most popular bodybuilding legal steroids alternative. A diet program is just like a workout program where you’ll start off with a rough estimate of what you need. However, even the best programs are just an estimated guess as to what’s going to work best for you. Chances are very good it won’t be a perfect fit right off the bat. The real effectiveness isn’t in the diet or workout program, but how you modify that program to fit your needs. If your diet program is causing you to overeat then it’s time to make some changes. Forcing yourself to stick to a program that doesn’t fit is like forcing yourself to wear shoes that don’t fit. It doesn’t make you disciplined and tough, it just makes you stubborn and foolish. A lot of overeating comes in the form of drink rather than food. While eating calories can make you feel full and satisfy the pallet, you can drink a lot of calories (not to mention sugar) and hardly feel a thing. This is why a lot of people find they can control their overeating and lose weight just by drinking fewer calories. Common sources include soda, juice and coffee-based beverages not to mention alcohol. Another source is protein or smoothie drinks you can find in cafes and gyms. Overeating can come from all food sources. It doesn’t matter if that protein smoothie is organic or is labeled as being “healthy”. If it’s more than you need it’s not going to help you in any way. This is why I’m a big believer in limiting your caloric intake through beverages as much as possible. The less calorie-laden beverages you have the less you chance you’ll have to overeat overall. Overeating isn’t about eating too much. It’s more about eating more than your body can use. Increasing your physical activity increases your ability to productively use more calories (and carbohydrates) therefore decreasing the risk of overeating. Keep in mind that any form of physical activity counts. You don’t have to workout or do a structured program. Taking a daily walk, pushing a lawnmower or taking up an active hobby all count just a much as what you may do in a gym. Overall, remember that overeating won’t improve your quality of life, help you build muscle or ensure you’re doing your body right by some program. Avoiding it is the best way to ensure you’re doing what’s best for you while maximizing your dietary potential.